It's been a while since I broke down and made something sweet and decadent so I made the family some fudge. This is San Francisco style adapted from a Ghirardelli recipe. Fudge is easier to make than it looks. There are just a few rules you should always follow when working with chocolate. When using a double boiler for melting never ever let steam or water get in your chocolate or it will seize up and be ruined. Chocolate is oil base...water and oil don't mix. If you are making something over direct heat like this fudge always use a heavy bottom pot so that your chocolate doesn't burn. Never try to rush the melting process and make sure to always stir. Chocolate, especially chips, will retain its shape even when melted so without stirring you may overheat the chocolate and ruin it. 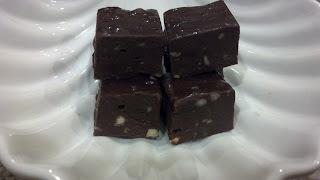 Line the pan with wax paper, leaving some to hang over the edges so you can grab and lift the fudge out when its set. You can spray the paper a bit with cooking spray but whether you do or not depends on a few things...if your impatient and want that fudge just when it sets then spray because the paper will stick to the fudge. If you are patient and really let it set up then it should peel off just fine. In the heavy pan over medium heat melt the chocolate, marshmallow and milk stirring constantly. Once completely melted remove from heat and right away stir in the vanilla, salt and nuts. Immediately pour into the prepared pan spreading it out evenly. Refrigerate for a minimum of 2 hours or until firm. Enjoy! Keep any extra, if there is any, in the fridge.